GoWiki is the 'engine' underlying Sensei's Library which presents the pages and diagrams based on a pure text version stored in a database. GoWiki is a collection of PHP scripts which interface with a mySQL database, custom made for Sensei's Library. GoWiki is based on PhpWiki which can be found at Sourceforge. 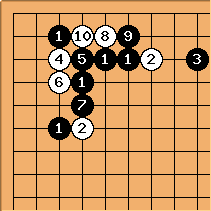 Other Wiki Wikis about Go can be found at Go WikiWiki. axd: Because I tend to see SL a bit as a reference wiki (well, I know others too!) and I'm currently looking around for wikis, I was wondering if it would be possible to submit this wiki to http://www.wikimatrix.org/ to compare its features with other wikis - even if - I guess - this is a rather specialised wiki. Are GoWiki's sources available ? Arno: if you are just looking for a wiki engine, then I suggest that you have a look at PhpWiki above. GoWiki is based on version 1.2. PhpWiki has been developed further, has an active development team, version 1.3 has many more features, is very easy to install, ... In short: this is the sane (and best) choice. A list of other wiki engines can be found at Ward's wiki at http://c2.com/cgi-bin/wiki?WikiWikiClones. The only thing that GoWiki adds are the diagrams. However, this and other minor enhancements are not coded in a clean style, as the source was never meant to be published. The source could (if at all) only be published on alt.tasteless.jokes. If you absolutely have to have to sources you can email me. No documentation, no support, nasty code, hacks, bugs, and workarounds. Note: The current GoWiki code bears next to no resemblance to PhpWiki. The code was forged (forked?) in late 2000 and both branches developed very differently. BenjaminGeiger: I'm trying to write a basic go-diagram processor for MoinMoin, which entails rewriting the diagram code in Python. I can generally glark enough from the PHP code to get the basic idea, but I'm still in the dark about one thing: How are the board images saved and used within SL? Specifically, are the board images and SGFs cached and reused, or are they generated each time a page is loaded? How are the names chosen? (They look vaguely like MD5 checksums.) And why do the preview diagrams look so different? Arno: the images are cached and reused. Just have a look at the HTML source of a wiki page and you see that the images there are real PNG files. The names are MD5 hashes over the diagram content - but any naming scheme is good enough really. It is useful to detect what diagrams have changed and need to be created or deleted. Preview looks different because actually they are a composite of small images (just look at the HTML source). But you got me thinking: it should be easy to create the graphic on demand. Will put it on my todo list. MarkD: Arno, will this break the Slot programs conversion routines? Or will the database format be unchanged? Arno: the format will remain unchanged as it only affects the edit preview and archiv views where the diagram is no longer available in the current wiki. It might reduce comment spam/vandalism if GoWiki had support for the new link attribute "rel=nofollow". All major search engines will be watching for it; all publicly-accessible wikis should probably implement it in some way. See Preventing Comment Spam, by Google. Also recommended is tagging the "old" versions of pages so they won't be indexed by search engines. See A Case of Wiki Spam for an example of how to do this. google-blog.dirson.com is collecting news about which Wiki engines support the "nofollow" tag. I just made a MediaWiki go diagrams extension which uses the same syntax (and some of the code) as SL. Need it to create a wiki for the Bulgarian go community but I guess it might be useful to others, too. This is a great wiki, so try it! Imagist: I feel that a major limitation to the capabilities of Sensei's Library is that sltext2png only displays numbers up to 10. 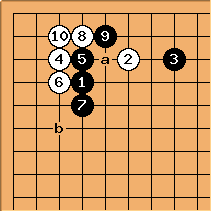 This makes it difficult to show even basic joseki sequences (take the example below). It should be possible to keep consistency by rebuilding the script slightly and expand these capabilities. If numbers up to 99 were allowed and spaces were used for the dividers between intersections, that would make diagram code less readable, but in exchange diagrams would be more flexible. See below. It's worth noting that 0 can (and should) continue to be treated as 10 for diagram purposes for compatibility with the old diagrams.